The mulled wine flavours in which the chicken is cooked smacks of winter, and is delicious served with a creamy leek mashed potato or baked potato or you could even serve it with couscous. Accompany with seasonal vegetables or braised red cabbage. Put the wine, mulled wine spice bag, and sugar in a pan. Bring to the boil and bubble until the mixture has reduced, about 10 -15 minutes. Add the satsumas studded with cloves. Season the chicken skin and in a large pan, heat the oil and fry the chicken pieces until golden. Add the onions, garlic and cook for a further 5 minutes. Add the flour and cook, stirring, for 1 minute before adding the reduced wine and stock. Bring the mixture to the boil, then cover and cook at 200°C (400°F) mark 6 for about 1 hour, the sauce should be the consistency of gravy. 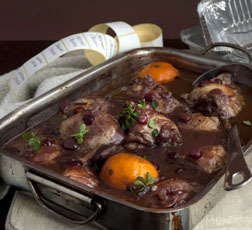 Uncover the casserole, stir in the cranberries and cook for a further 30 minutes. Remove the satsumas and put into the compost bin. Serve the casserole immediately. To freeze: Make the recipe up to the end of step 3. Cool then put into a freezer proof container, label and freeze for up to 3 months.To use: Thaw over night, put into a flameproof casserole, slowly bring to the boil on the hob. Add the cranberries and reduce to a gentle simmer. Cook for 30 minutes or until heated through.